First-class treatment isn’t just for celebrities – you, too, can live large in Los Angeles on this all-night party tour. Score instant access to the hottest Hollywood nightclubs, VIP drink specials and expert guidance from a fun-loving tour host. Really, this is the ultimate night out in Tinseltown. Going out in Hollywood, you’d love to have a VIP-style evening with the type of red carpet treatment celebrities enjoy – and that’s exactly what you’ll get with this all-night Los Angeles party tour. You and your fellow partiers will meet your professional tour host just outside the evening’s first nightclub. A moment later, the red velvet ropes will part, and you’ll saunter on inside – without paying a cover charge. Once inside, the VIP treatment continues with high-value drink specials – you certainly won’t have to put much of a dent in your wallet to stay in the party mood! And, of course, your enthusiastic tour host will always be nearby, ready to help make sure everyone has an incredible a-list nightlife experience. You’ll get to live like a VIP at four of the best Hollywood nightclubs – the freshest party hotspots, where big-name celebrities like to hang out. Nightly club crawl lineups vary, but only must-see venues like Project LA, The Study, St. Felix and OHM Nightclub make the list. 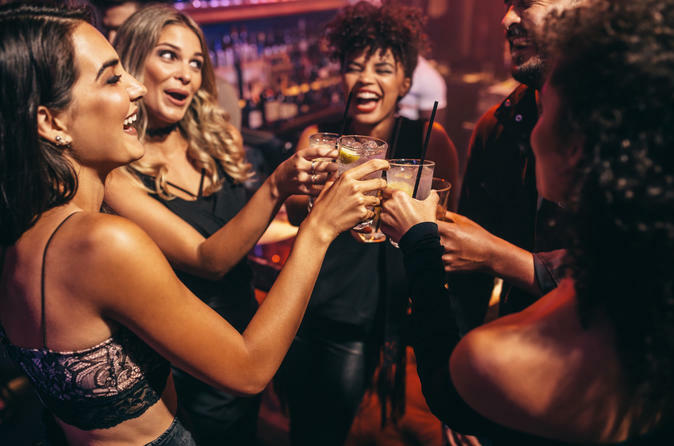 It doesn’t matter if you’re celebrating a special occasion, planning an epic guys’ or girls’ night out, or just want to mingle as a single – this VIP party tour has everything you need for a first-class Los Angeles nightlife adventure.